Yesterday, around 4:40 local time in Syria, the United States Navy has launched 59 Tomahawk strikes from the USS Ross and USS Porter, eastern Mediterranean, and hit the Shayrat Airfield. 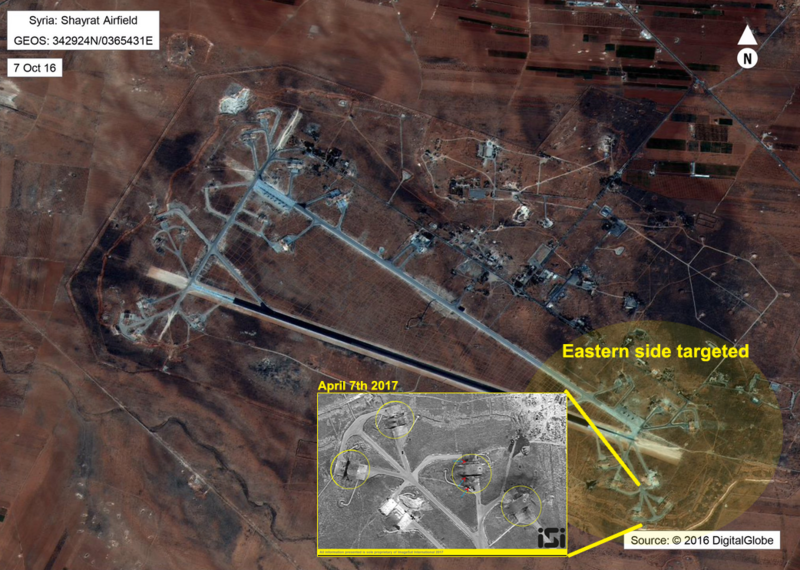 This airfield was used by the Assad regime to launch the deadly chemical attack that killed up to 80 people, including women and children, and wounded hundred other. The missile strike was a limited action with no further plans to extend or escalate the situation. On April 6th, reports came out that the Pentagon is already working on several military options that US President Donald J. Trump would launch to punish the Assad regime, further enforcing Nikki Halley’s threats issued in New York. The purpose of the strike was to send a strong message that this US administration will not tolerate anyone crossing the “red line” that the Obama administration failed to reinforce; the usage of chemical weapons will attract devastating consequence. This also emphasized that for the Trump administration there are no options off the table. About the attack: Was it fair? 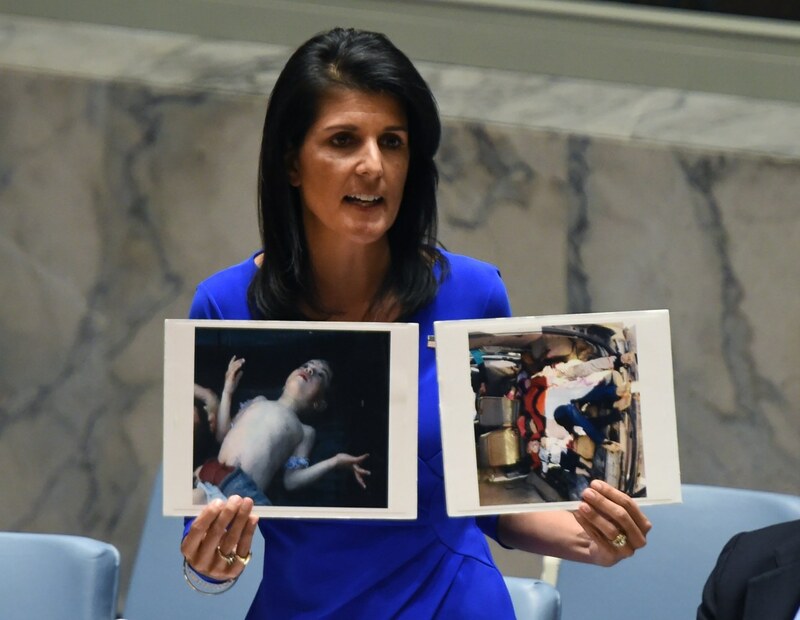 Upon the emergence of the sensitive photographs showing babies, children, women and many people suffocated to death by the chemical attack, the international community called the United States to take action. The Security Council was failed again in acting on a major issue. Any attempt of passing a draft resolution condemning Assad was vetoed by the Russian Federation. Therefore, the US, as motivated by Nikki Halley was forced to act alone. The Tomahawk missile launch was commenced after the Russians were notified beforehand so they can get their personnel stationed in the Shayrat base, to safety. Moreover, the strikes targeted the eastern side of the airfield where no Russian soldiers should have been present. The strikes killed seven Syrian Arab Army (SAA) soldiers and wounded at least nine. Up to 20 fighter jets were destroyed or severely damaged, fuel tanks, ammo depots, aircraft shelters completely destroyed. The runway was damaged but it is now, reportedly, still up and running. The Tomahawk strike was firm but fair, yet the chosen target was not completely destroyed and the runway was not neutralized. Why? The Syrian Civil War has an unique dynamic, any damage taken by one actor, benefits the other, in this case Tahrir al-Sham and ISIS could have taken advantage. The strikes neutralized some jets and logistics, but it did not made the infrastructure unusable. The airfield is badly needed by the Assad regime to fight-off the waves of ISIS counter-attacks in Palmyra and deliver air strikes against the Al-Qaeda affiliate Tahrir al-Sham that spearheads an offensive near Hama. Consequently, the limited action was balanced and fair. However… The Syrian Air Force conducts daily air strikes with barrel bombs, cluster and incendiary munition in urban areas, regardless of collateral or civilian casualties. One may say that the way the Assad regime has used its air fleet over the past six years is completely illegal and should not be allowed to continue. Therefore, US has threatened that further actions may be taken if needed so. In that case, those strikes would strip the air capabilities off the Assad regime. There are two main components of the discussion of the legality of the Tomahawk strikes, one is domestic Congress), the other external (United Nations). Senator Rand Paul, the libertarian that even voted against Montenegro’s ascension to NATO, has called the US strikes as being illegal/ unconstitutional for not consulting Congress first. The President of the United States does not need congressional approval for a limited military action, only for declaring war. The Constitution declares the President to be the Commander in Chief of the Armed Forces. He can, by law, send them to wherever he wants and do, basically, anything he wants within the confines of the law. In the other hand, Congress can cut funding to military operation so in long-term campaigns, consulting the legislative representatives is somehow necessary. The Obama administration maintained in 2011 that U.S. involvement in the months-long air campaign against Libya didn’t require congressional permission because American forces were largely playing a supporting role as part of an international coalition, for example. In addition,a White House official said more than two dozen members of Congress, both Democrats and Republicans, were briefed Thursday by White House and Cabinet officials. House Speaker Paul Ryan, the No. 3 U.S. official, said he was among those informed. Furthermore, the perpetuation of chemical weapons is against the US vital national security interests, and taking into account the preemptive post-9/11 doctrine, the response was in accordance with the United States engagement doctrine. Operational Security (OPSEC) was also a major element of keeping the strikes off the political arena. President Trump refused to even suggest or tell the press in regards to his plans, yet he notified the Russian authorities before the strike. What does that tell us? Can we doubt the OPSEC element in this case? President Trump wanted to act in accordance to the non-aggression treaty between the US and Russia in Syria, and avoid unneeded escalation. Moreover, the Tomahawk missiles still managed to destroy a consistent number of jets which means that the notification was not too early enough to provide the Syrian regime with the chance to evacuate all of its air assets – Again, a balanced and fair act. 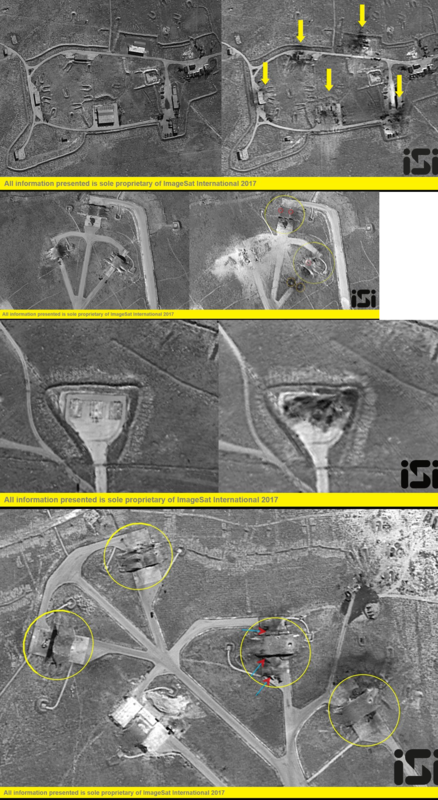 In contrast to an incident in 2016, when the Syrian Air Force bombed a several Kurdish fighters that clashed with them in the city of Hasakhe, without notifying the US that had Special Operations Forces near the targeted location. While the incident was isolated and no further fights occurred between the Kurds and Assad, it remained as an example of lack of fairness from Damascus. Following Barrack Obama’s empty threat of „chemical weapons means crossing the red line”, the Assad regime continued to use them. And while a US Navy destroyer was heading towards eastern Mediterranean the phone rang – the Russians proposed a deal. A joint US-Russian framework would supervise an OPCW (Organization for Prohibition of Chemical Weapons) mission, mandated by the United Nations, that would oversee the destruction of Assad’s chemical stock. This deal came in September 2013 after the John Kerry – Sergei Lavrov negotiations at Geneva. The United Nations then unanimously issued a mandate for the mission with resolution 2118, but the ball was still in Assad’s court. He was responsible for making the facilities and deposits public, that would be then transferred to the port of Latakia where they would be destroyed on the sea by the partnering countries to the framework. 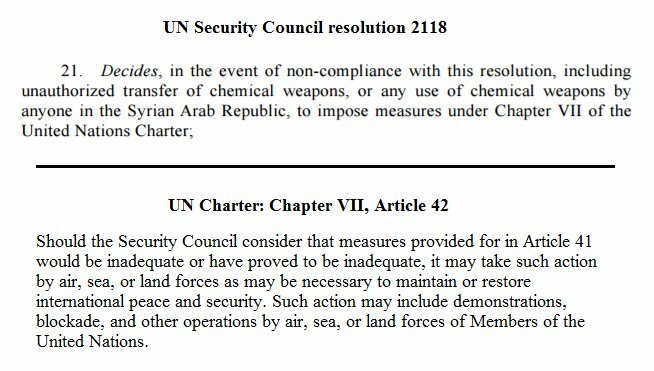 The mandate stated clearly that if the Assad regime does not turn-in its chemical weapons before late-2014, the United Nations Security Council “the UN Security Council should impose measures under Chapter VII of the UN Charter” – can include force but can be limited to other kinds of sanction.. This chapter empowers states to act unilateral or joint action in order to restore international peace and security. Which translated in power language, would have allowed the US to strike Syria. 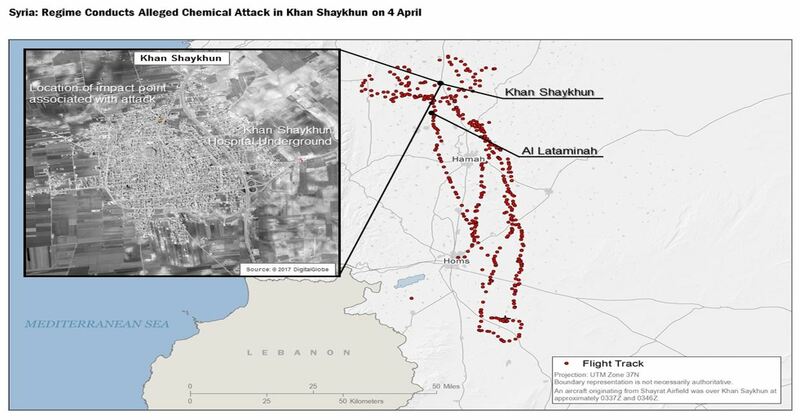 However after the mission ended in October 2014, the OPCW and the UN concluded that the Assad regime had still used chlorine gas in Talmenes (2014), Sarmin and Qmenas, Idlib (2015). This confirmed the international community’s hunch that the Assad regime had still retained an important stash of chemical weapons and hadn’t disclose all of its facilitates and depots. Furthermore annual reports found on the OPCW suggested a negative outcome of the Kerry-Lavrov deal. Chemical weapons were also used through-out 2016 and early 2017 yet the death-tool was lower, so media coverage was proportional, and the informational environment was filled with ambiguity. Nonetheless, it seems that always the chemical attacks against Rebels are aiding Assad. While not trying to suggest that the Rebels are the „good guys”, Assad’s usage of illegal weaponry is valid for sanction. And the chemical attack from four days ago in Khan Shaykun was yet another confirmation. Therefore following Assad’s insubordination to the 2013 deal supervised by the US-Russia, in which the Syrian government was supposed to hand over their weapons to the OCPW-UN, the operative clause would come into effect: „action under the Chapter VII”. Consequently, any proposed UN mandate sanctioning Assad would have been, as always, vetoed by Russia, thereby making the „formalities” for activation an unrealistic endeavor. So, does it have a legal base? Absolutely. Is there an act authorizing it? Partially, the one from 2013, but it’s not formalized due to the Russian veto, regardless of their promised good will. Was Assad really behind the Syrian gas attack? –Yes: theory backed by the United States of America, United Kingdom, Germany, France, Israel, Turkey, Saudi Arabia, UAE, Australia, Jordan, Lebanon, the European Union and NATO. –No: theory backed by the Russian Federation, the Assad Regime of the Syrian Arab Republic, Islamic Republic of Iran and North Korea. 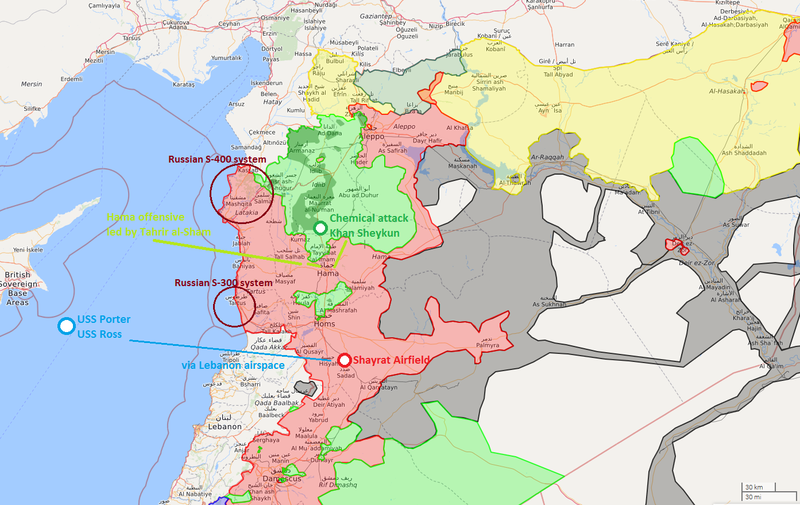 The United States, Israel and Turkey have a flight path of a Syrian jet that flew over Khan Sheikoun at that exact time of the chemical strike. The Turkish autopsy concluded that the chemical elements are the exact ones traced in the previous Regime chemical attacks. And given the fact that the Assad regime has not turned-in all of its chemical stockpile, the context is suggestive enough. The Kremlin’s version is that an Syrian airstrike on Rebel-held chemical weapons facility created the unwanted and devastating effects. This is inconsistent because, as photos showed, the chemical attack actually took place on a street. The impact created a crater in the middle of a road, where shell pieces could also be spotted. There is also the counter-theory enforced by specialists saying that these are binary chemical weapons – the weapons actually do not exist in its final form; only a few minutes before being launched are the two main substances combined weaponizing the missile. Also the composition is divided into two components, inert and alcohol; any hit on that and it will just burn or show an immense ball of fire. Therefor any airstrike on a chemical weapon’s (CW) depot will destroy the vast majority of the substance, given the flammable character of it. Ok, then why did Assad do it? Why now, when he’s winning? The Assad regime was in the middle, and still is, of fighting off a Rebel offensive in Hama, launched by the al-Qaeda affiliated Tahrir al-Sham. The chemical attack occurred on that front, from where the supply lines from Idlib Governorate intersected to reach the frontlines: southern Idlib towards Hama governorate. Moreover, the attack comes several days after the has US repeatedly stated, through Secretary of Sate Rex Tillerson, Un Ambassador Nikki Halley and the Secretary of Press Sean Spicer, that they are not focusing on a regime change, but on combating ISIS. Capitalizing on this, the Assad regime launched a massive and public chemical attack, in order to send a message: „I am using chemical weapons and no one’s going to stop me. Give up (rebels)! Resistance is futile. The US has abandoned you.” – a chemical-induced nihilism to demoralize the enemy; not a very intricate psychological operation to apply in a war-room, but undoubtedly efficient. The main roadblocks that most of the decision makers are faced when weighting on a decision in Syria are these two: „paralysis through analysis” and „overthinking secondary-to-third effects”. Due to the high geopolitical strikes, individual implications and military detachments of most of the involved backers, any military action in Syria could have a „domino effect” that can lead to a wider war or sanctions. Therefore, many Presidents get paralyzed by overthinking their actions, while unable to balance actions in order to not stir unwanted responses or effects from other actors. Ex-US President Barrack Obama is the best example in this case. Yet, President Trump acted in a firm but balanced manner, striking but not degrading, following national duty but not isolating of other actors, and finally, limited and not systemic. The Russian response was minimal and mostly for the public appeal: suspending the non-aggression pact in Syria, boosting coastal defenses and condemning the US. Moreover, they sent a destroyer in the Mediterranean without naming its destination – yet that probably is the port in Latakia or the Russian base in Tartus -> In conclusion, a lot of hot air. On the other hand, the informational attack was unexpected. Many website from the „not mainstream” underground with conspiracy-leaning views have completely turned against Donald Trump as InfoWars, Alt-Right community on 4Chan, and individual influencers as Milo or Paul James Watson. Furthermore, this same informational elements and actors have spread a Russian-originating hash-tag „SyriaHoax” that is trending in the US, via InfoWars and most of the Alt-Righters. The hash-tag encompasses conspiracy theories suggesting that the chemical attack was a false-flag. Whether they judge geopolitics through ideological lenses or they’re affiliated with Russian interests or operational works, it remains to be seen. In the end, I hope that this situation report has clarified some of the important question that this episode has raised. Moreover, the Syrian Civil War continues with no end in sight, this being an isolated pause from the regularly Regime vs. Rebels struggle and the US fight against ISIS, seasoned with Turkish-Kurdish skirmishes, Israeli protests and Iranian or Russian strategic interests. Worth mentioning is the timing of the attack. Donald Trump chose to launch the Tomahawk missiles right during the visit from Chinese President Xi Jinping, an action that will speak volumes in regards with the North Korean issue.